John Cummings Ross wins The Prideview Cricketers’ Cup ’12! 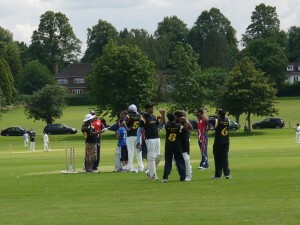 The inaugural Prideview Cricketers’ Cup, contested on Saturday 21st July ’12, was a tremendous success! We are proud to announce that the event raised over £3,500 for Big Hug Foundation. This will cover the annual expense of the 33 children’s school fees and uniforms at the orphanage in Coimbatore, and will also be put towards the construction of a new orphanage with a capacity for 50-70 children (as the current one is rented on a lease expiring in March 2014). More info on this can be found here – and thank you once again! To see all the pictures, check out the photo album on our Facebook page. Things appeared to be going as expected when Team Prideview thrashed John Cummings Ross (a routine occurrence in the Prideview boardroom), and Bircroft Insurance, favourites to win the group (given they had matching shirts and trousers), batted Liquid Bubble out of the opening game. But in round 2, Liquid just fell short of a Prideview total crafted by a Test Match innings by Shailesh Patel, and JCR overturned Bircroft’s massive total thanks to Rohan Desai smashing 2 sixes in the final over. Suddenly propelled into a qualifying position thanks to their head-to-head record vis-à-vis Bircroft, JCR booked their place in the semis by convincingly beating a demoralised Liquid Bubble side, who ended up with 0 points in 3 attempts. This meant the already much-anticipated lunch-time clash between Prideview and Bircroft became all the more important – and it did not disappoint! 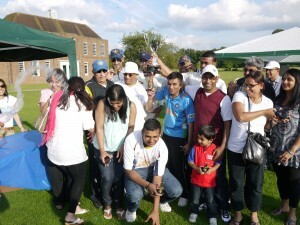 Nilesh Patel and Sameer Amin celebrate with their team after running 4 off the last ball to tie the game! With Bircroft’s strong batting line-up expertly contained by the Prideview bowling attack for just 26 runs off 4 overs, Bharat Thakrar ruthlessly plundered 21 off Vijay Parikh’s final over, taking the final total to 47! 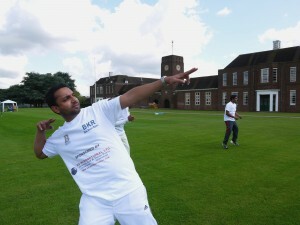 A determined chase by Prideview did not look to be enough, with Nilesh Patel requiring 9 off Shiv Popat’s last 2 balls. But he completed a fine captain’s knock smashing 4 off the penultimate ball and then running a rapid 3 off the final ball, before stealing a 4th run amidst the chaos following a missed run-out chance. The bails were dislodged as the batsman completed the 3rd but were not subsequently uprooted from the ground as they stole the 4th ! With the match tied, Bircroft’s fate had to be decided by a bowl-out. Deep into sudden death, only Prideview’s 12 year-old sensation Samay Unadkat and Bircroft’s Sagar Thakrar were able to strike (both twice), and even after bringing in the onlooking Prideview senior management and Bircroft directors the deadlock could not be broken! The feuding captains finally shook hands on a draw, sending Prideview and JCR into the semis whilst Bircroft had to settle for a place in the Associates Final. 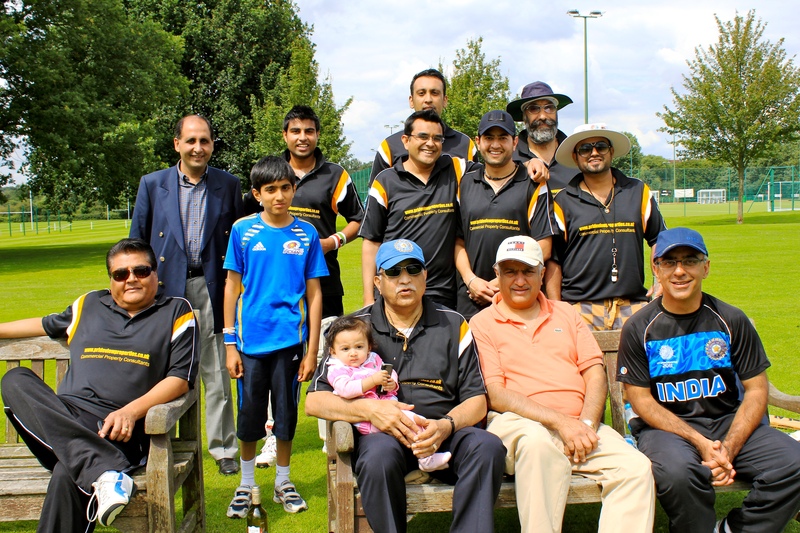 Tournament favourites Indus Vipers (the only team to have played 6-a-side cricket before) were in no charitable mood, despite wearing the Big Hug Foundation T-Shirts. With some devastating batting performances, they dismissed each of their 3 opponents with relative ease, with the only question being whether they would also take a bonus point from each game. On the other end of the table, Rakesh Dua’s very sporting Dua & Co team were most generous, ending up 4th with 0 points and booking themselves a place at the bar! This meant the battle for 2nd place would be fought between the two Indian food caterers, Bana Knight Riders and Orchid Lounge, in their 3rd round decider after lunch. 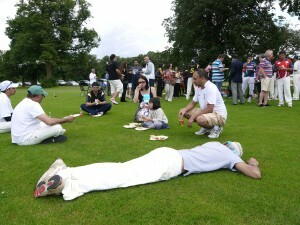 BKR already had the upper hand, having won the battle to be the exclusive caterer of the Prideview Cricketers’ Cup (no mean feat), and a few eyebrows were raised when the BKR team could be seen performing Olympic warm-up exercises during the lunch break whilst members of the Orchid Lounge team were passed out by the Bana Caterers’ buffet…something in the food perhaps?!! Orchid were first to bat, but after Amit Anand’s tight first over only went for 1 run, it was always going to be uphill from there. It was clear the only runs they would be getting would be off the pitch (!) and BKR’s opening pair of Sachin and Dhruv Patel made light work of the 37 run target chasing it down in only 3.1 overs! 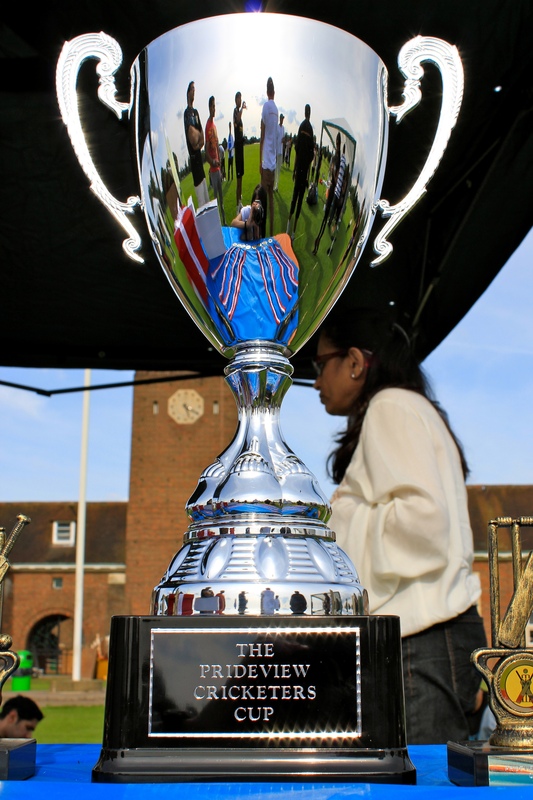 Indus followed by BKR went through to the semi-finals, whilst Orchid efforts earned them a place in the Associates Final. With Bircroft still charged up after their controversial clash with Prideview, and Orchid Lounge still reeling from BKR’s buffet lunch, there was only going to be one winner. Orchid Lounge’s 36-2 was no match for Bircroft, who cruised to victory by 3 wickets. It was a game many thought would be the Associates Final, but with both of these two teams performing brilliantly in the group stages, it was a worthy semi-final. BKR scored 51-3, the highest total scored on Pitch 1, the largest pitch of the 3 used and a daunting target, which included the biggest six of the tournament, hit by Sachin Patel over mid-wicket. BKR thought they had booked their place in the final but Prideview, who had yet to lose a game chasing, were unphased. They kept their wickets in tact during BKR’s initial onslaught, before Jagi Sohal’s charge in the 4th over which led them to a comfortable 4-wicket victory with 3 balls to spare. A match that everyone thought would be a formality was anything but, with JCR delivering another telling batting display, and the whole team contributing to a hard-fought 56 all out. A tough ask for Indus and with wickets falling regularly and thanks to a well bowled last over by Dilip Unarket, who took 1 wicket for 7 runs, JCR restricted Indus to 51-4 and won by 5 runs. JCR lifting the Prideview Cricketers' Cup 2012! With JCR finding their form when it mattered, and Prideview’s veterans visibly feeling the heat in their 5th game, a repeat of these two team’s opening match was always unlikely. Prideview batted first, but after losing both Nilesh Patel and Jagi Sohal early to run-outs, the lower order led by Sameer Amin did well to find the legs to get to 33 all out. Despite the Prideview bowlers keeping it tight til the end, Jay Thakrar and Kush Patel kept their nerve to win by 5 wickets and with 1 over to spare. John Cummings Ross won the Prideview Cricketers’ Cup 2012! 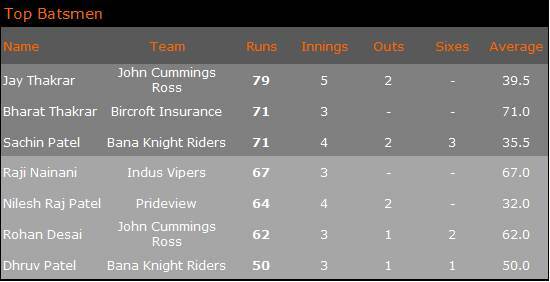 Below are the details of the batsmen who scored over 50 runs and the bowlers who took 3 wickets or more. Jay Thakrar topped the batting standings but a special mention must go to Bharat Thakrar and Raj Nainani who both amassed large totals without losing a single wicket. The top 6 hitter was Sachin Patel with 3 blows, and the only other batsmen to hit 3 sixes was Amit Mansigiani (Indus). but his total runs of 27 was much lower. Although 3 bowlers ended up with 4 wickets, Nitin Modi’s unbelievable economy rate of 2.5 secured him top bowler status. 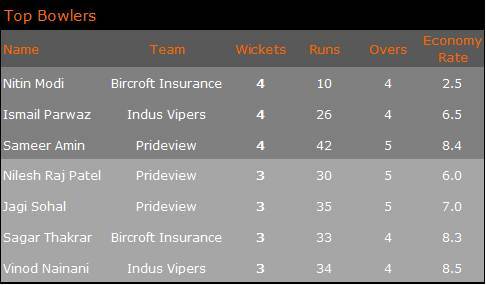 3 of Prideview’s final-reaching side made it into the top 7, demonstrating the importance of good bowling in this format of the game. Prideview captain Nilesh Patel was the only player to score 50+ runs and take 3 wickets or more, making him the tournament’s top all rounder. Click here to see the tournament brochure, with details of the teams, fixtures, raffle, venue and sponsors. See you next year!